Here comes the 14th and final part of a mini series in which I paint the water line, add minor bits and pieces and put it in the water. This project has been on my to-do list like forever. Over the last years I acquired a couple of tools and now I have a somewhat decent workshop. The Raspi 3 is there and quite powerful enough to run MAME. I even saved an old TV from the dumpster and had it sitting on the shelves for ages. So it was like now or never. I have a soft spot for 8-bit arcades. When I was a kid, maybe 13 or 14 (around 1980! ), I was on a vacation with a good friend of the family. He was a truck driver and drove always from Germany to Italy and back. A trip usually took 4 to 5 days. So I was on a truck for a week, which felt really cool. We delivered some stuff to Bologna and a couple of more places. Then we drove back to Milan and we had to load arcade machines. I saw these for the first time. At least it felt like that. All machines where running. All coin doors were open! Somebody saw me standing in front of them with huge eyes and showed me how to trigger the switch to get credits for free. BAM! I was hooked. I played Galaxian for 2 hours straight. As the truck was loaded and we had to leave, they had to peel me of the arcades! 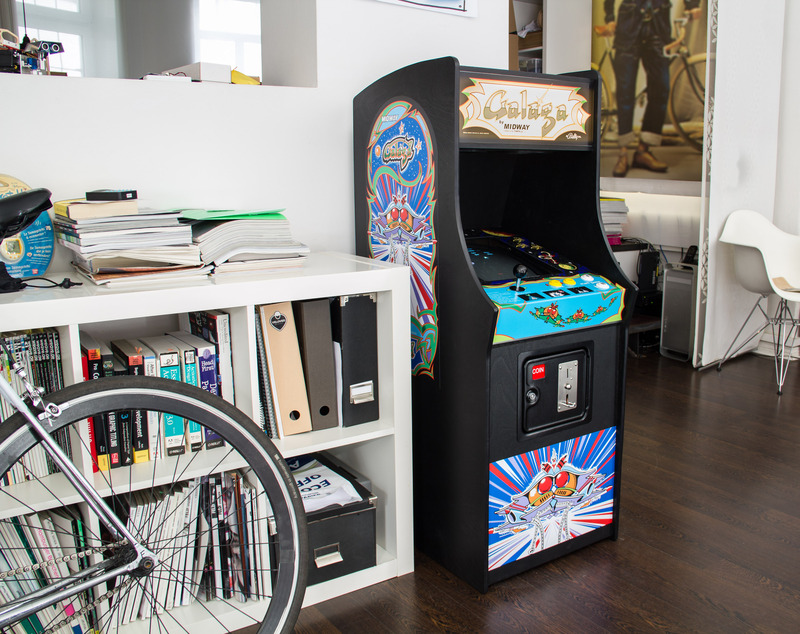 The next couple of years I dumped a lot of coins (Deutsche Mark) into arcade machines and I got quite good at Galaga, BombJack and Gauntlet. Then, ages later, I stumbled upon MAME, the Multi Arcade Machine Emulator and had fun digging up the old games. I even built a controller box to be able to play at least with proper joystick and buttons. Then, 4 months ago I decided, that I should have all tools together, that are required to build a complete arcade cabinet. The required skills I would learn by doing, hopefully. Four years ago I built The Almost Useless Machine, a tiny machine that tries to cut a wooden dowel. Here comes the second incarnation, a bit stronger and a bit more robust. From time to time I enjoy simple and quick projects. It’s like taking a break from that other long running project. 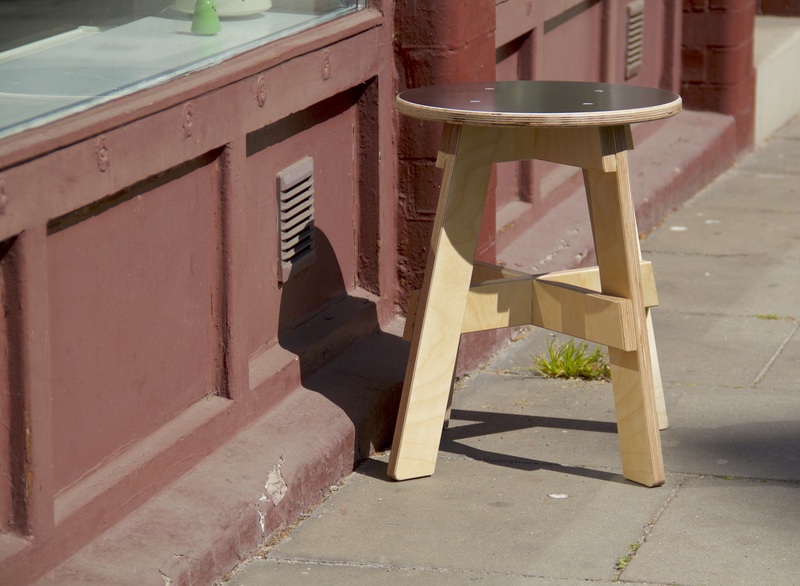 This simple stool took me around 4 hours to make. Best of all, it’ll never need to re-charge. Thinking up robots and machines is one of my number one pleasures. Being able to realize them, tops everything. I added a couple of power tools to my small shop and as a result, my projects got bigger and more mechanical. Here is my latest creature, the Paint Machine. 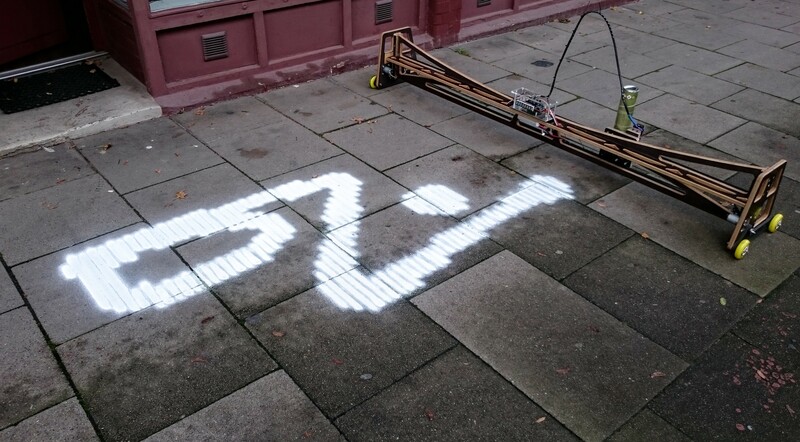 It’s a machine the prints simple bitmaps with spray chalk on the street or sidewalk. I started working on this in April and built almost everything from scratch. A lot of time went in designing parts, trying them out and then re-designing them. Now I guess, it would require a lot less time to build a second one. I always loved watching marble machines, especially the creations of denha. These little machines are super cute and very well made. So a marble machine was on my todo list for a very long time. To start easy, I decided to build the most minimalistic marble machine I could think of. Just one oval and a single lift mechanism. Since I started playing with electronics, I dreamed of building my own robot. Not buying a kit, but making every part of it myself. It took quite a while, almost 11 months, not full time, of course, but on and off, with smaller projects and work in between. Last year I bought a small used lathe, then a small mill and beginning of this year, 2014, a ShapeOko 2 CNC mill. Every machine has it’s own rabbit hole. Hard to not get lost for a beginner like me. So many ways to screw up. I checked a couple. 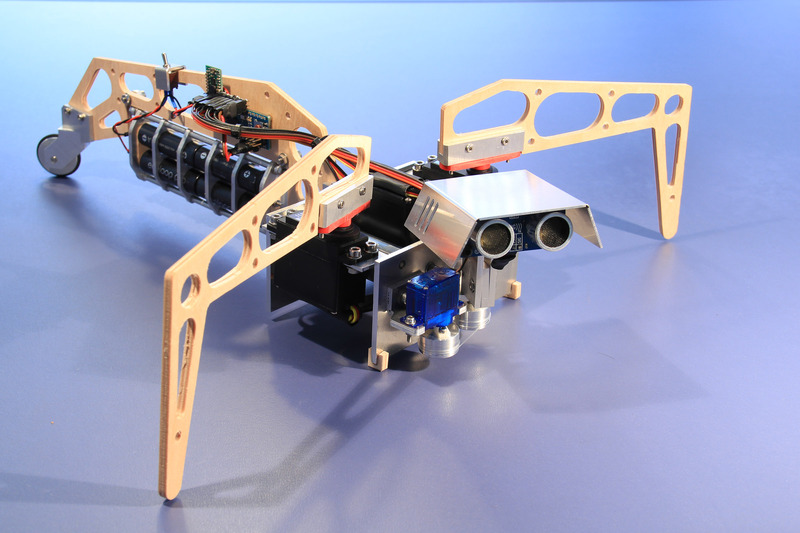 So here it is, my very first robot, halfbug. All parts are machined and manufactured by myself, not counting the Arduino board and the servos. Everything is screwed or clamped together without any glue. A while ago I bought and assembled a ShapeOko 2. It took a while to get it running and I also done a few upgrades. The first project is a keychain for the new/old car of my friends and studio colleagues, Arne and Sören. They are preparing this old Audi V8 for a rally around the baltic sea. Last July I bought a small used lathe. It’s a Proxxon SD 300, also known as Hobbymat MD65 or as PRAZI Saupe/Unitech SD-300. It can hold pieces up to 300mm in length and weighs about 45kg. Why a lathe you ask? I wanted to do more mechanical stuff. 3D printers are fine and all that but I wanted something stronger. At least aluminum. This article is also available in Serbo-Croatian language by Vera Djuraskovic, thanks Vera! And now also available in Portuguese, thanks Artur! Aaaand now also in Lithuanian, thanks Giedrius! For quite some time I had my Raspi lying around. And some RGB Pixels as well. So it was about time to bring them together. The last couple of days I built a web interface that I can use to control my pixels. That’s more a technical demo, rather than something useful. But I learned quite a bit. For the server part I decided to use node.js. For the client I wanted to use Angular.js and Bootstrap. To have the UI work on a mobile as well, I had to include Angular-touchevents. The pixels are connected to the Raspi vi SPI. Although there are node modules for SPI and Adafruit pixels, they were not working out of the box. I had to poke around a bit to make them work. Changes are included in the node-pixel repository. The browser opens index.html and renders an array of 25 clickable batches. Clicking and dragging on a batch changes its color and lighting. These changes are send to the server over web sockets. As seen in the demo, there is a very noticeable lag between updates. For a more pro solution you may want custom build clients and your own custom protocol (or maybe DMX?) to get rid of that. The Node Beginner Book, very helpful node.js tutorial. We all know, we should use more renewable energy. Here is my contribution. Use solar power if you want to cut 20mm wooden rods. And plan ahead because it may take a while. 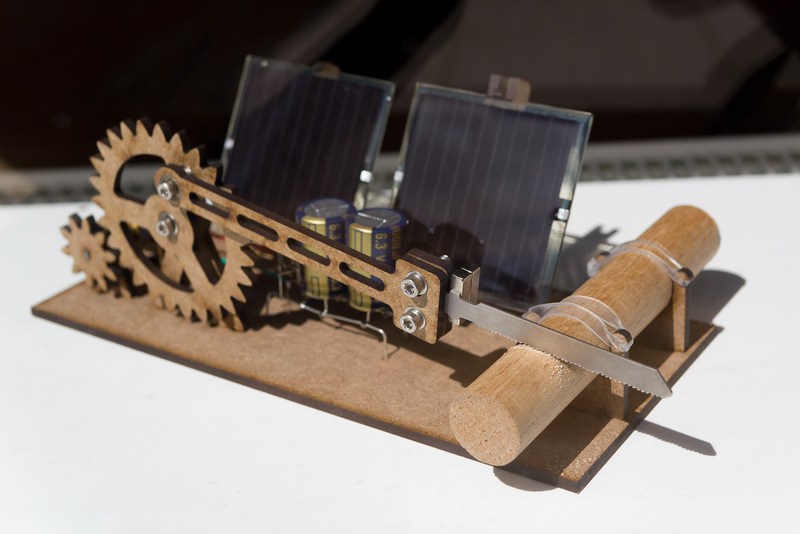 This little machine uses a so called solar engine to drive the motor. 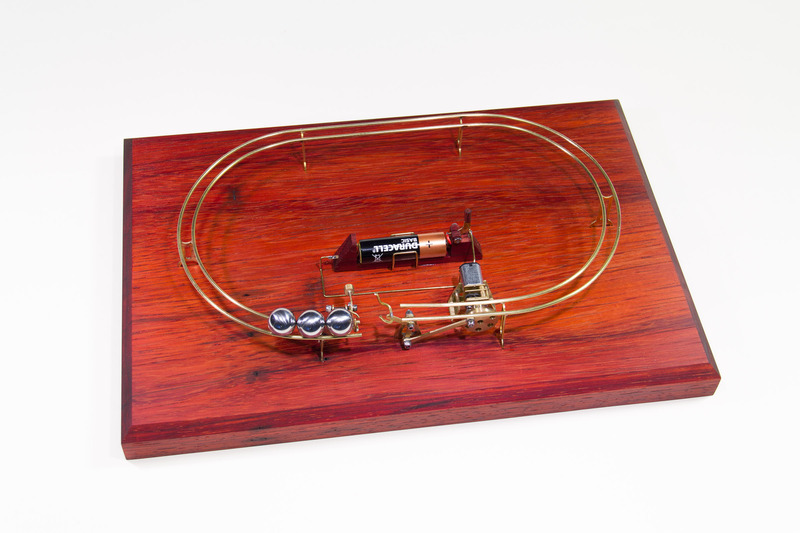 This solar engine is able to collect tiny amounts of energy over time and stores it in large capacitors. When the voltage reaches a certain level, it opens up and uses all the stored energy at once to drive a motor. These engines were used to drive tiny BEAM-bots and were quite popular a while ago. A lot of information can be found at beam-wiki.org on how to build them and how they work. In July Jeremy Abbett of Makers and Company came over and we discussed, what would be a cool project for Google’s Creative Sandbox event in Berlin. Finally we settled with “Home Sweet Home”, a Google Latitude Arduino driven Lamp. The idea is, that your kids at home have a hanging lamp that tells them how far away dad is and in which direction he is heading. The closer he comes home, the lower the lamp would go. So it’s kind of an ambient tracking thing, but only for your family.